A safeboda customer enjoys his ride | File Photo/Safeboda Uganda. In a bid to promote a cashless economy in Uganda, moto-taxi ride hailing firm, Safeboda has today launched a 50% discount on its cashless payments. All customers who pay for their rides cashless will a month get a 50% discount off every payment they make. “This is one sure way to save on your transport costs,” company said during the announcement. For instance, if a passenger is estimated to pay UGX4,000 for his/her trip, they end up paying UGX2,000 saving UGX2,000. The Bukoto-based firm want to make cashless payment a priority for its riders and passengers. The company launched its cashless option in August 2017 after both parties (riders and passengers) always had an issue when it came to change. With the cashless option coming into place, it simplified the payment plan. Passengers load cash on there Safeboda accounts through MTN and Airtel mobile money, terming it as “Credit”. Today, becomes the second time the company runs the 50% discount on ride payments. In June last year the 50% discount was initiated offering to customers paying either by cash or credit. But this time round, in a bid of promoting a cashless economy, the company has stuck to only customers paying cashless. According to Safeboda announcement, the promo is scheduled to run for a month. 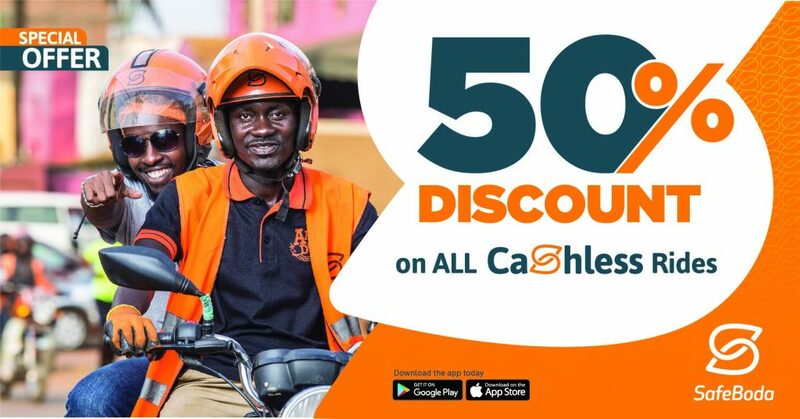 Safeboda Uganda launches a 50% discount offer for its passengers paying cashless for their riders. Offer to run for a month | File Image/Safeboda Uganda. Meanwhile, Safeboda is still leveraging and leading in the moto-taxi hailing industry with over 8000+ riders. 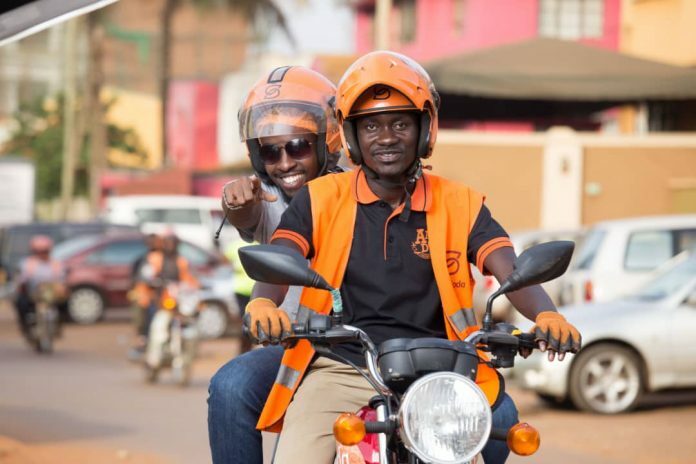 During the company’s bi-annual party celebrating 5 years in Uganda held earlier this year, Safeboda spokesperson told this reporter that the company expects to reach 10000 riders in Q2 this year. Leading the market doesn’t stop the company from making the experience for its customers and riders better knowing it has to face competition from likes of Bolt—previously known as Taxify, Uberboda, Dial Jack. Passengers can now load credit on their account to enjoy and experience the 50% discount offer.